Researching summer holidays for the family often starts out fun but ends up being a huge stress as you try to find something that’ll cater for everyone. In my research this year, cruises seem to be an increasingly popular option – but which destinations will suit the kids (and you)? Obviously, there’s the constant favourite of the Caribbean or the Bahamas, but do you really want to try and dodge hurricanes or try and escape from the dreaded crowds in these places? And then there’s the Mediterranean, which also presents heat- and crowd-related problems. Heat is often a problem for the kids (and could be for you, too), and in that case, there’s nowhere cooler than the Arctic. While you will need to dig out your winter woollies, this doesn’t mean you’re not getting to enjoy the sun as there are still hours upon hours of sunlight here. Plus, it’s highly unlikely you’ll be thinking about the weather as you sail along because your attention will be fully focused on the sensational landscapes and gorgeous wildlife – polar bears, reindeer and penguins, to name a few! Another place where you can avoid sky-high temperatures and without travelling too far is the Baltic. A cruise here will take in a number of highlights, including some of the top cities in Russia and Scandinavia, e.g. the unmissable St. Petersburg. This gives you and the kids a lot to see and do, but without limiting the amount of relaxation time you get. When you’re on board the ship, you and your partner can relax and unwind while the kids are entertained by the vast array of activities and clubs provided. Still hankering after a Caribbean cruise? Then you may want to try the southern region instead as this significantly reduces the risk of hurricanes and will also mean fewer crowds. Boasting white sandy beaches, plenty of water sports and tasty seafood, this will be a cruise to remember. And if you do want some good weather and hot temperatures, you’re guaranteed this here. 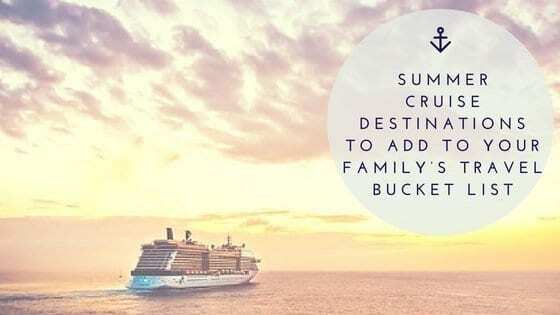 It doesn’t matter how varied your family’s taste is, you’ll all get what you want out of a cruise holiday, whether it’s plenty of relaxation and sun or adventures around every corner.